Finally, a mainstream head unit company putting some money into technology and tooling in the digital arena! Sony’s new RSX-GS9 is long overdue and the industry is taking notice. To fully understand why this is so significant, let’s revisit digital media for the last few years. In the beginning, there was the Logitech Squeezebox, this unit is still used today, it had a great touchscreen interface with the ability to use an external hard drive utilizing whatever file format you wish to use: MP3, Flac or WAV for example. You might be saying, so? The Logitech has a full digital output. In a nutshell, the unit plays back digital music without converting back to analog. This also allows you to have a huge hard drive essentially giving you unlimited space for as many songs as you like! Sounds awesome right, BUT the system was never made to be used in the automotive environment. Creative 12-volt installers adapted this unit to work in automobiles, but it didn’t integrate into the dashboard very well. The second generation of digital integration was using a 12-volt to 120-volt inverter using an iPod dock from Denon (several manufacturers make an iPod dock but for the example article, we used the Denon piece). The “dock” solution also had its own pros and cons. The biggest Pro is the ability to have a proper mount in the vehicle for digital playback. Con: When using electronics designed to work in a house, you get lots of noise (pops, whistles etc.) and you are limited to the device playback format. For example, the iPod/iPhone has limited space and does not play best sound quality format Flac, it is debatable that the difference between the Apple Lossless format is inferior in Flac but that is topic for another article. You can download several Flac file apps from the Apple Store, but the issue is space. Most iPod/iPhone can only carry 10-25 songs in this file format. The third generation was several manufacturers’ offering Flac playback on the head units. Kenwood and Pioneer offered playback but do not offer hard drive support but you can use a USB thumb drive. USB thumb drives are getting quite large, so this does become a viable option but the feature is only offered on a few models. If you’re not into specs, this head unit is dedicated and designed for high fidelity digital media playback. 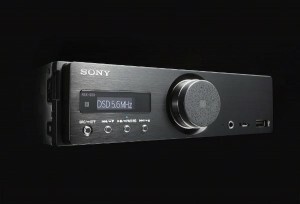 Most manufacturers add digital playback options as a second thought but Sony built this with one purpose, beautiful uncompromised digital reproduction of sound built for the automotive environment.